In mid-February I was lucky enough to return to Japan again for a mix of work and personal time. I flew into Narita airport on a late Friday afternoon and was wearing my trusty Grand Seiko GMT. On arrival caught the train to Shinjuku where I was staying for the weekend. The weather was quite cool with the temperature in the low single digits but it was a pleasant change from the 40 degree days we were experiencing in Sydney at the time. After checking into my hotel I headed to the closest Yodobashi store to pick up a data only SIM card for one of my phones during the trip. This just makes it much easier being able to quickly look up a watch model price, check google maps or translate a store sign. After setting up my phone with the new SIM it was getting close to the store closing time so I just had enough time to drop by Komehyo in Shinjuku to see what they had available. 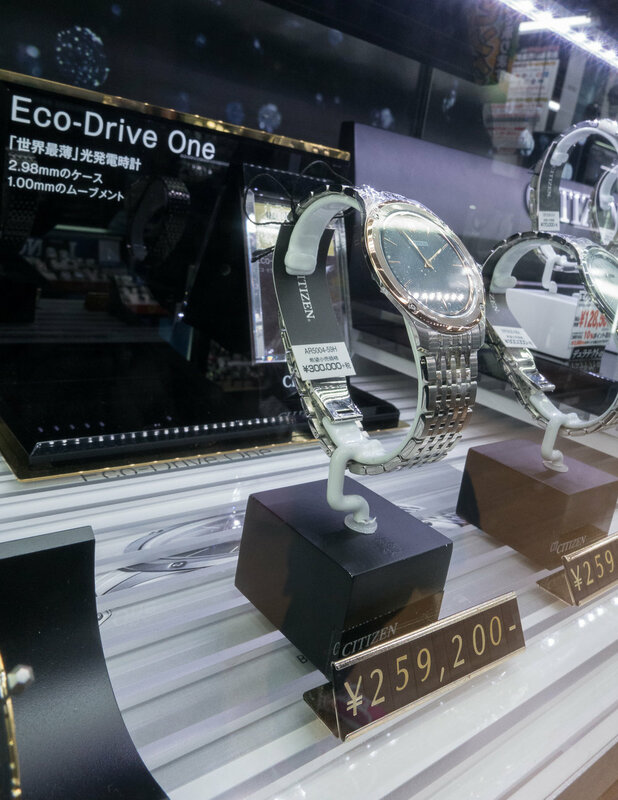 Komehyo is a brand store that sells second hand products including a wide range of watches located on the second floor. There was an interesting mix of models on display at the store as well as a fantastic looking blue dialed ceramic Grand Seiko GMT with the 9R16 movement. This was the SBGE039 that was a limited edition of 500 units announced at Baselworld 2016. It looked like it had never been worn and came with complete box and papers for around US$8000. While I did really like this model it was a little more than I wanted to spend especially on my first few hours in the city. Nothing else in the store really grabbed my attention so I headed back to my hotel after grabbing some dinner. The next day I woke to a cold and clear morning before I headed to the Tokyo Flea Market at Ohi Racecourse and had a quick look around there. As always there were lots of sellers with a wide range of goods and many of the stands have watches for sale. Unfortunately on this visit there was nothing that I had to have so I headed away empty handed. I caught the train back to Shinagawa and saw the train driver was wearing a Casio but also was using the JR issued 7C21 Seiko pocket watch. 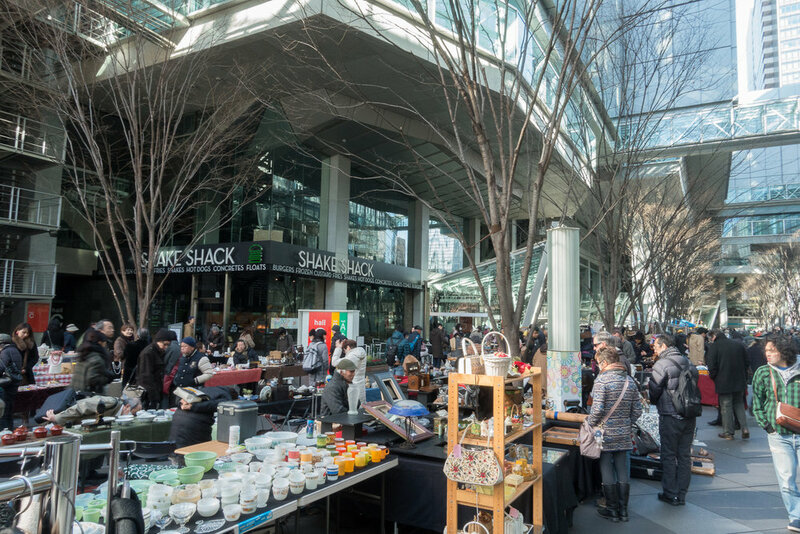 After transferring to Shinjuku I headed over to the Free Market of Vintage Watches (FMWV) that was being held at the Nakano Sun Plaza and not the traditional location in Ikebukuro. Likely due to the change in location the market was wrapping up earlier than usual so I only had a small amount of time before the auction section of the meet and the vendors began to pack up and leave. While I was there I did see an interesting mix of models, the vendors had many Japanese vintage watches as well as Swiss models. One vendor had around a couple of hundred watches with a strong focus on Japanese models. These included numerous vintage Grand Seikos, VFA and other high end or rare models. The seller also had a very nice silver GFA, the export version of the Superior, a high end twin quartz model from the early 1970’s that I would have purchased had I not already owned an example of this. While there were lots of nice models at the market I did not purchase anything. After the market I headed across the road to the mall at Nakano. There are numerous second hand watch stores, antique stores as well as cube stores where all sorts of items can be be found. I checked out the stores here but despite many nice watches there was nothing that I had to have so I left empty handed. I then headed across to the Ginza area where I visited Lemon, a consignment store that specializes in cameras and also has watches. The store had been reduced significantly in size in the last six months. There was nothing of interest here so I walked across to Watch CTI and here there were some pieces. There was a Seiko Grand Quartz Twin Quartz model with a very unusual agate dial and it was a model I had not seen in person before. Just outside of Watch CTI is a bakery where people wait for an hour in the cold to purchase toast. You apparently get the opportunity to select the toaster that you want used as well as how it will be cooked but I am not sure that I would wait in the cold for that long no matter how good the toast was. I then went back to Shinjuku and checked out numerous brand stores and secondhand shops. That evening I went to dinner with a friend and his wife from the Seiko and Citizen forum and we had a great meal and catch up. 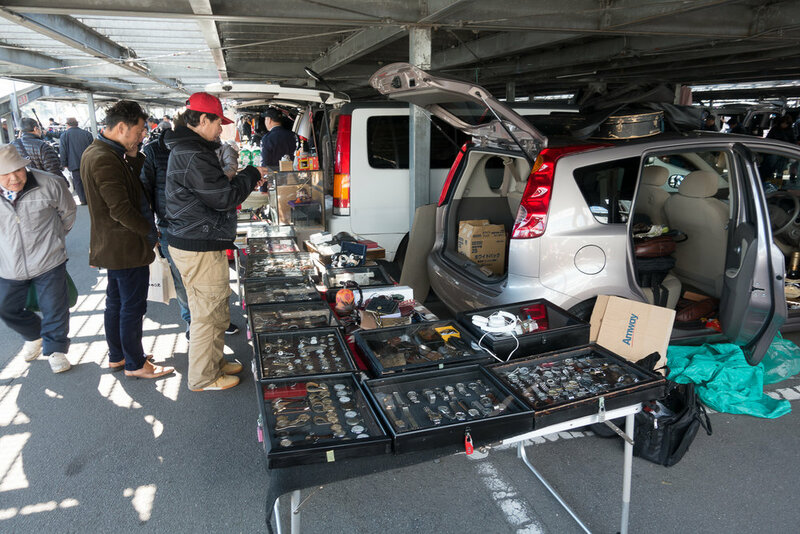 On the Sunday morning I headed off again to the Tokyo Flea market at the racecourse. It was busy as always and this time I managed to pick up a couple of items. 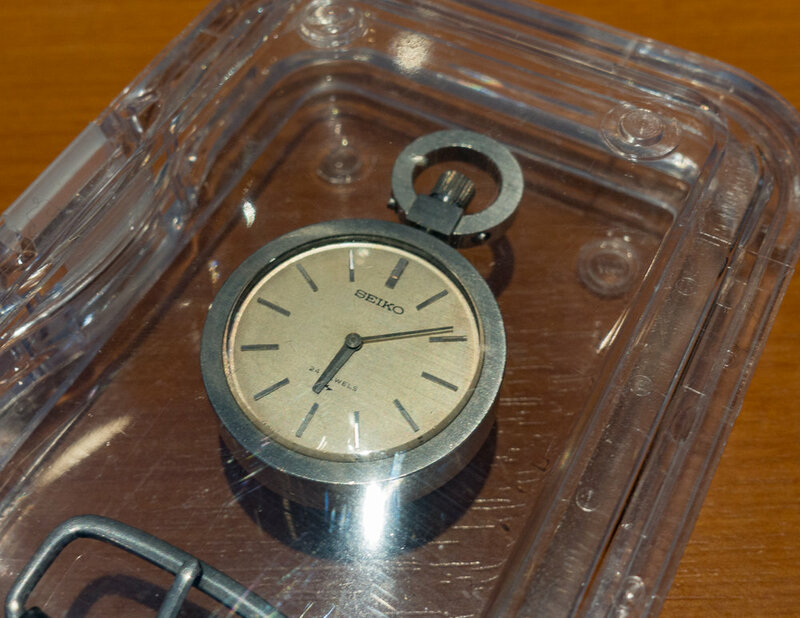 The first was a Seiko Sports watch box from the 90’s. 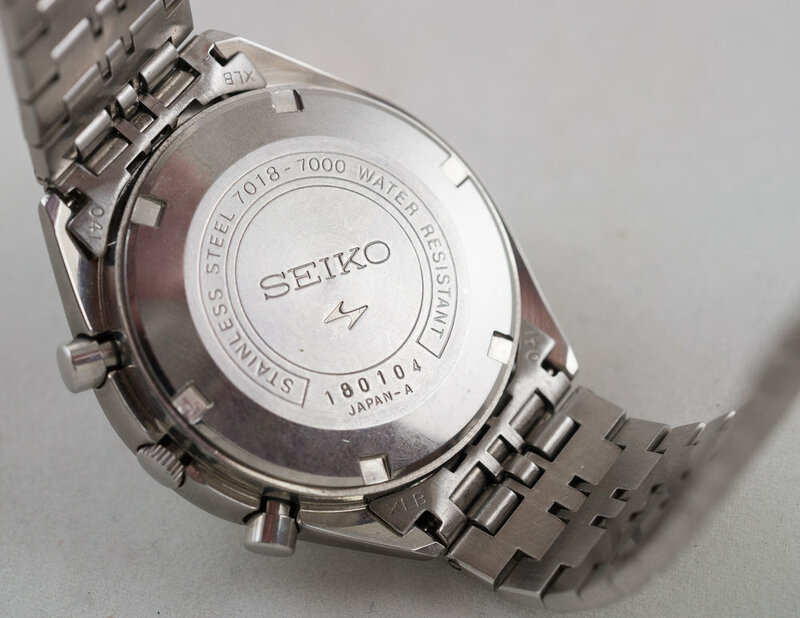 These round boxes screw together and were issued with most of the Seiko sports models at the time. While not particularly exciting for less than a dollar it seemed too good to pass up. The other item I purchased was a Seiko 6618-8001 “braille” watch designed for vision impaired users. This watch allows the crystal to be flipped out of the way and the hands to be felt to determine the time. 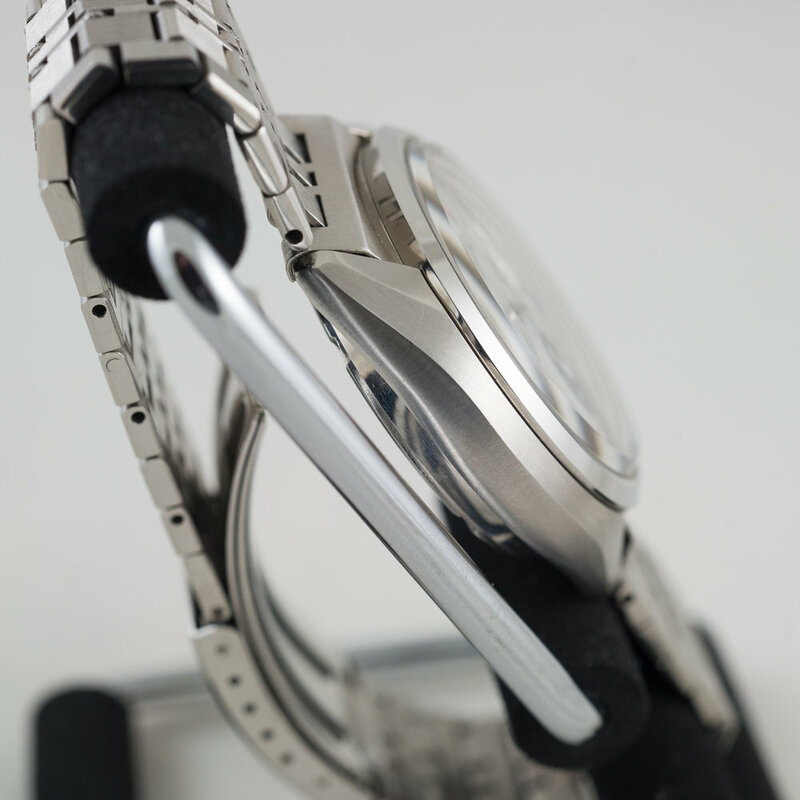 The hands are a sturdy metal and are screwed to the movement to improve their robustness. 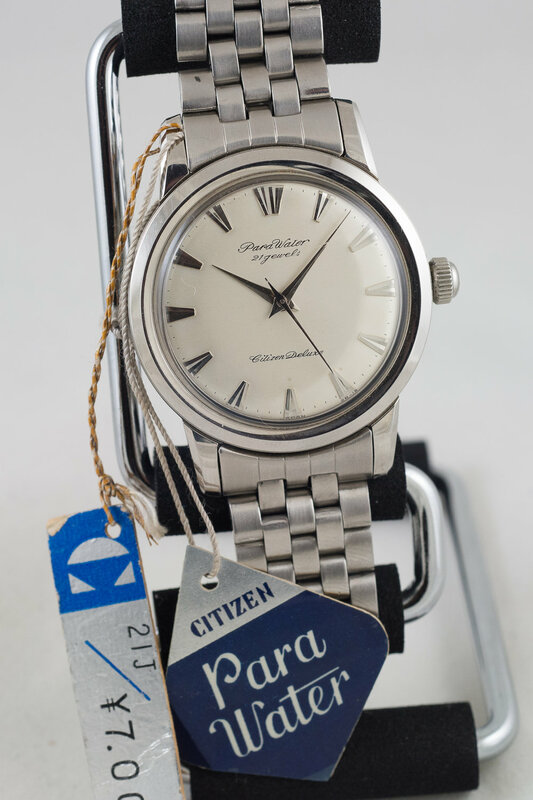 This example was in quite good condition as you often find that the markings on the dial are worn off or the dial is discolored and quite dirty from constant use. I had been on the lookout for a nice example of this model for a while so was pleased with this acquisition. After the markets I headed back to Ginza and visited the WAKO store. It is always a pleasure to visit the store as it is one of the best presented shops and the staff are always extremely pleasant. I next headed to the Seiko Premium Boutique that is just down the road. This store is the premier store for Seiko and they have their highest models for sale. There was a rose gold 62GS reissue model SBGR094 for sale and this was a limited edition of 100 units. In the store there is also a section that displays historical models and they had an original Laurel, the first automatic model, a Gyro Marvel, a beautiful 3180 first model Grand Seiko, a one button chronograph (with terrible incorrect bracelet) and lastly a Credor GBBD998 skeleton with a 6899 movement. 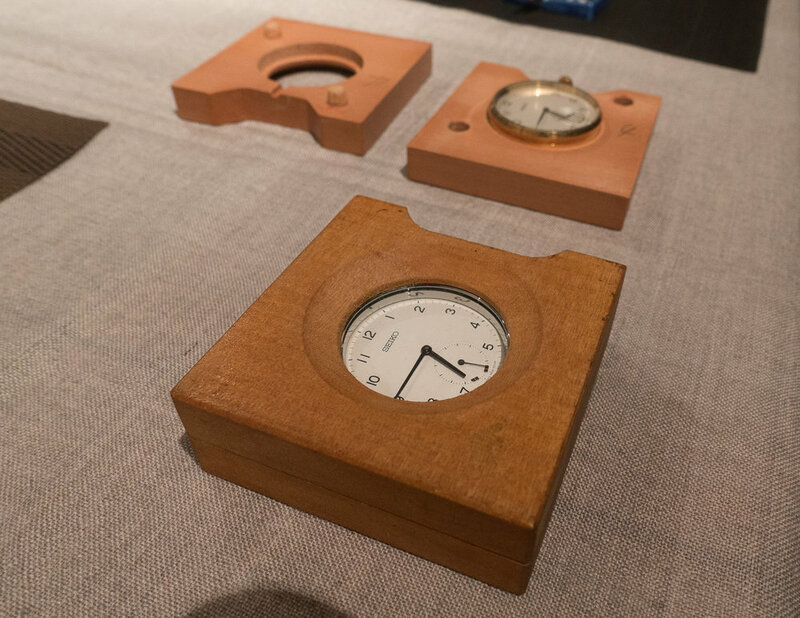 The pieces on display are on loan from the Seiko museum and they change every few months. 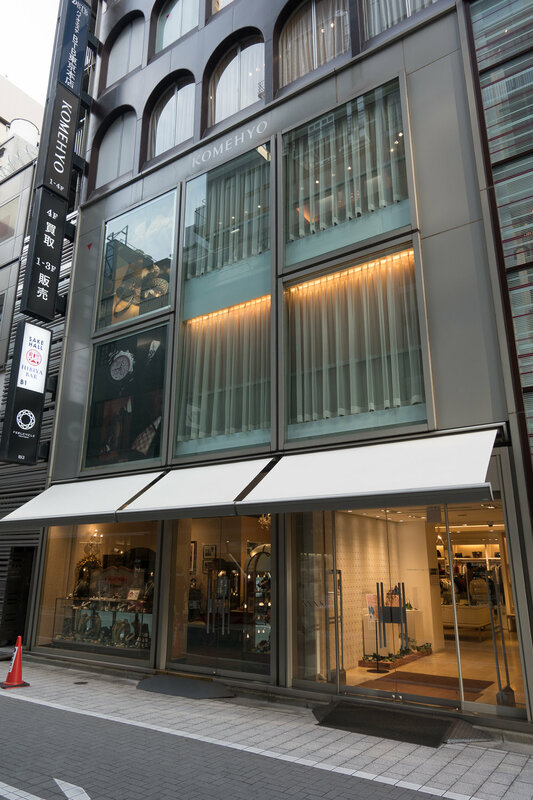 I next visited the Ginza Komehyo store but they did not have anything out of the ordinary. 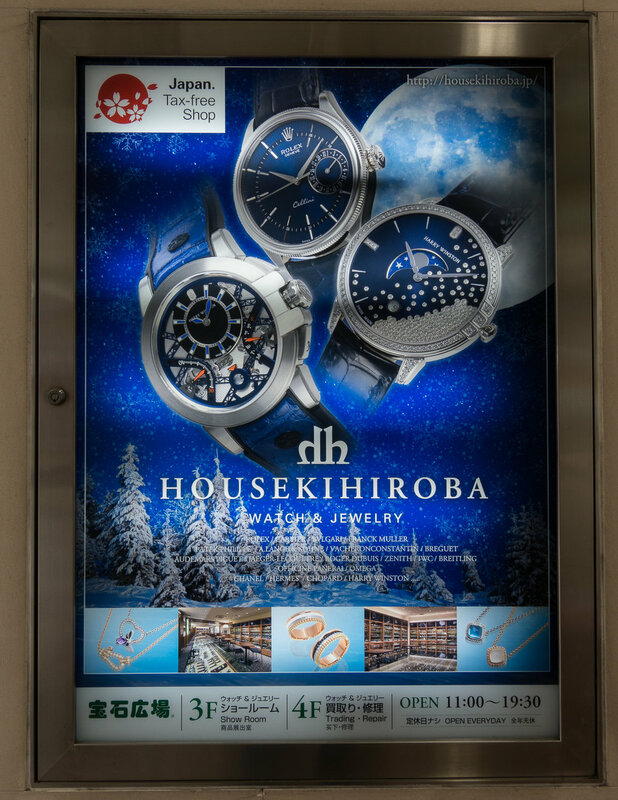 After leaving the Ginza area I returned to Shinjuku and visited the Yodobashi dedicated watch store. 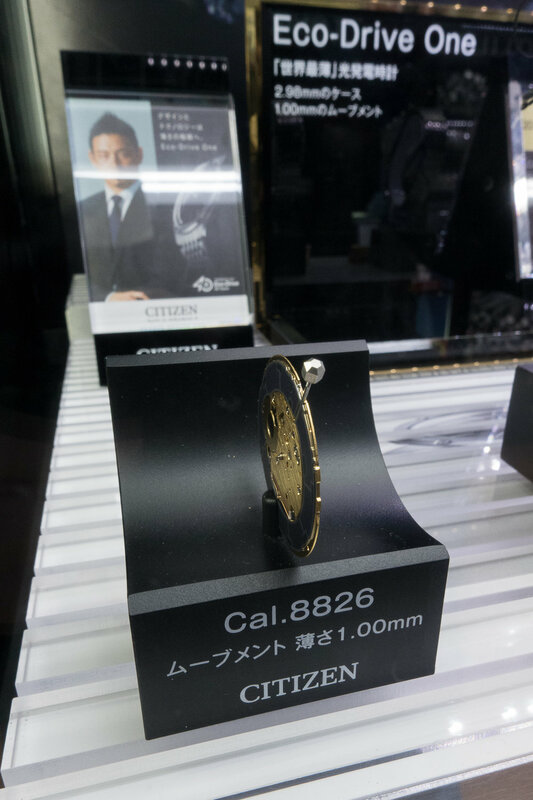 Here they had the new Citizen Eco-Drive One models on display. This is a watch with an Eco-Drive movement that is just 1.00mm thick and this is placed into a case that is just 2.98mm in thickness. This is a stunning technical achievement and can only truly be appreciated by seeing it in person. After leaving this store I heading south for a week of work. On the Friday morning after a very long and busy week of work I headed back to Tokyo and made my way to the Seiko Museum in Higashimukōjima. At the museum I checked on some details regarding the Japanese Seiko watch catalogs that I have been collecting as I had been unable to find a 1988 volume. It turns out that I could not find one as there were no volumes issued that year just a small supplemental catalog. This may have been a cost saving measure as these catalogs are costly to print and the distribution to all retailers would be a very expensive activity. I also had some questions about the Seiko Tokyo factories previously built in the local area. I had a query about the factory that was pictured on a commemorative ashtray that I had recently acquired. 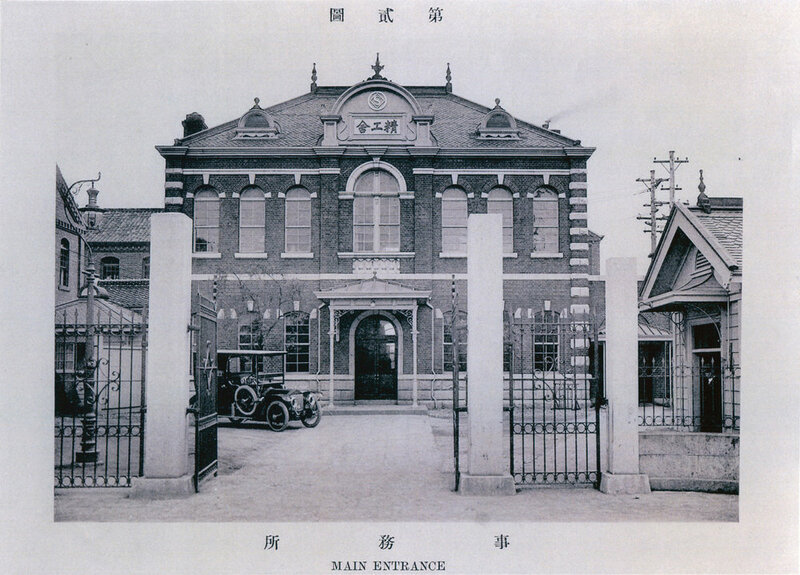 This was the original Seikosha factory location and it was here that the first factory was destroyed by fire after the Great Kanto earthquake in 1923. 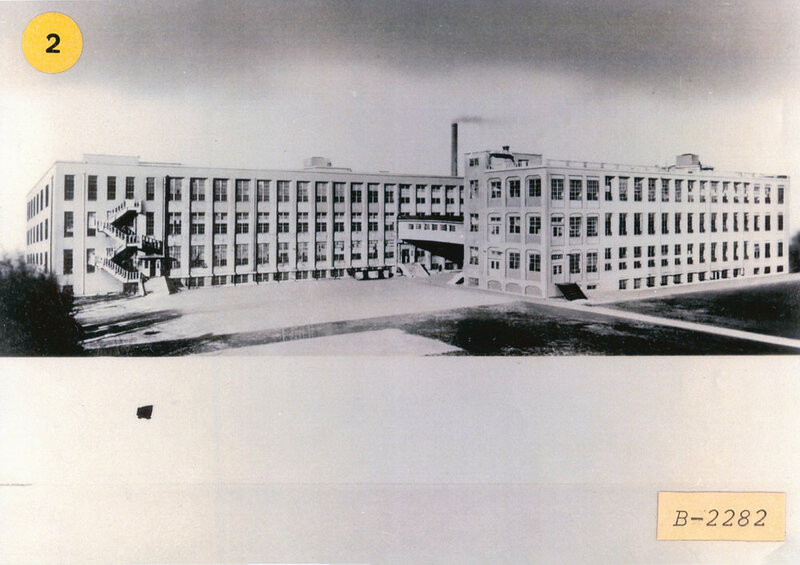 The new Seikosha factory was rebuilt on the same spot and is depicted in 1935 on the ashtray commemorating the completion of one of the main buildings. At around this same time Seiko was building a new factory just a couple of kilometers away just across the river in Kameido. 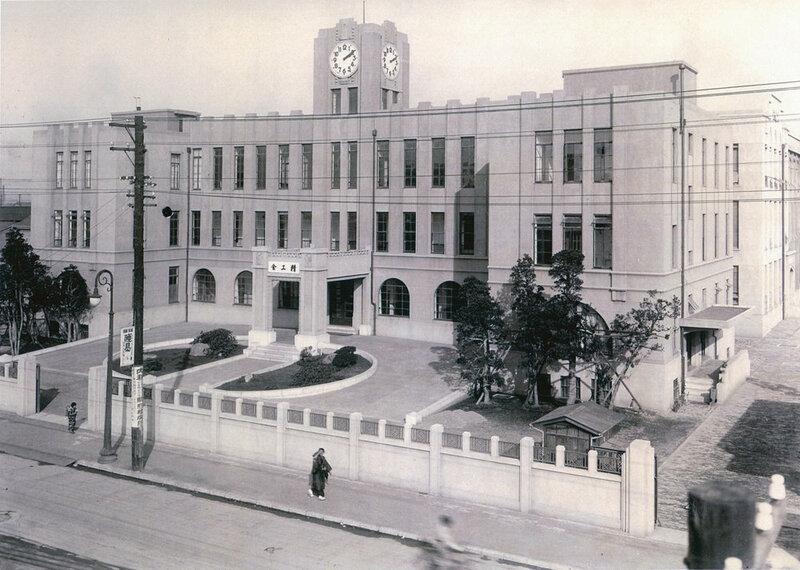 This was the Daini Seikosha, literally second Seikosha, factory that opened in late 1936. 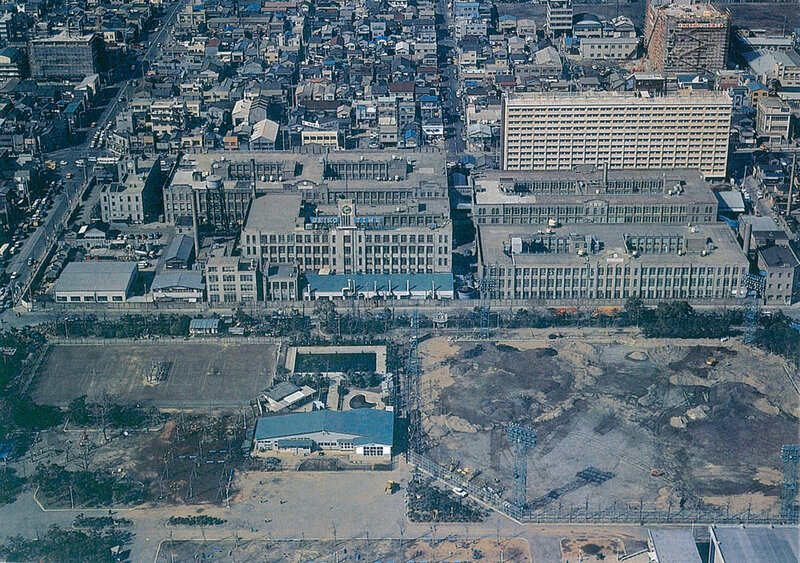 The watch manufacturing operations were then moved to this location while clock manufacturing remained in the original Seikosha factory on the opposite side of the river in Kinshicho. As the factories were so close it was possible for staff to hand carry parts and stock across to the new factory. During the second world war both factories were damaged by bombing and most staff from Daini Seikosha were moved to the Suwa region to continue production. After the war both factories were rebuilt and continued operation until the late 1990’s when they were both shut down. The Daini Seikosha factory in Kameido was closed in 1998. 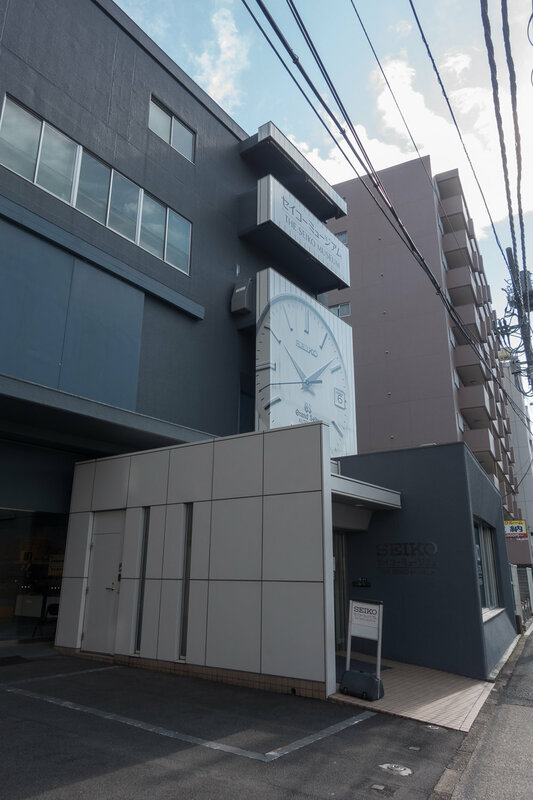 One interesting point is that the Seiko Museum’s original location was in the Seikosha factory in Kinshicho when first launched in 1981. The museum was established to commemorate the 100th year of Seikosha and remained at the Kinshicho location until the factory was closed in the late 90’s, before moving to its present location in Higashimukōjima. Before leaving the museum I saw a new exhibit that is available via appointment only. 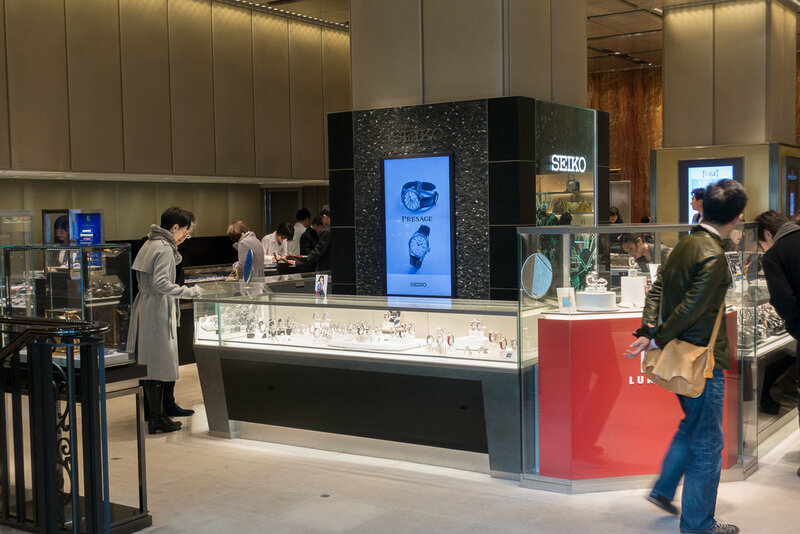 This is an interactive 3D application from zSpace that allows users to see the Grand Seiko mechanical, quartz and Spring Drive movements and interact with them. This allows users to see how the drive trains are connected or to see how the Spring Drive movement is assembled. In addition to the new exhibit I dropped by the divers display case and saw the original Seiko/Tropic strap that I donated on my last visit fitted to the 62MAS. This was just next to the 6105-8000 that was fitted with a ZLM01 waffle strap that I had previously donated. 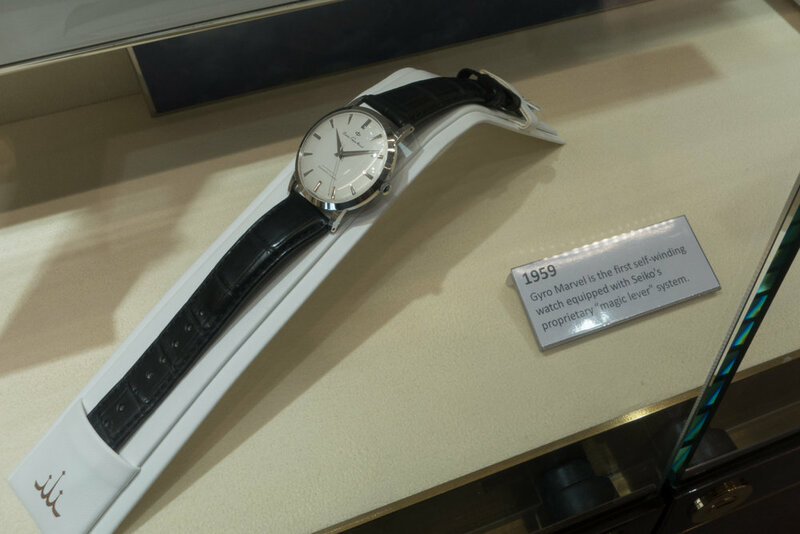 It was nice to see these on display and the watches looked much better with the correct strap fitted to them. I will create a separate complete write up on my visit to the museum and include a link to it here once completed. After leaving the Seiko museum I took the train to Kameido and visited the site of the Daini Seikosha factory. This location now houses the Sun Street mall but this was in the process of being demolished, so I would assume another mall or commercial building will be built in the same location. As it was only a short walk to the Olinas Mall that now sits on the location of the original Seikosha factory in Kinshicho I headed across there and grabbed some dinner before going back to my hotel. 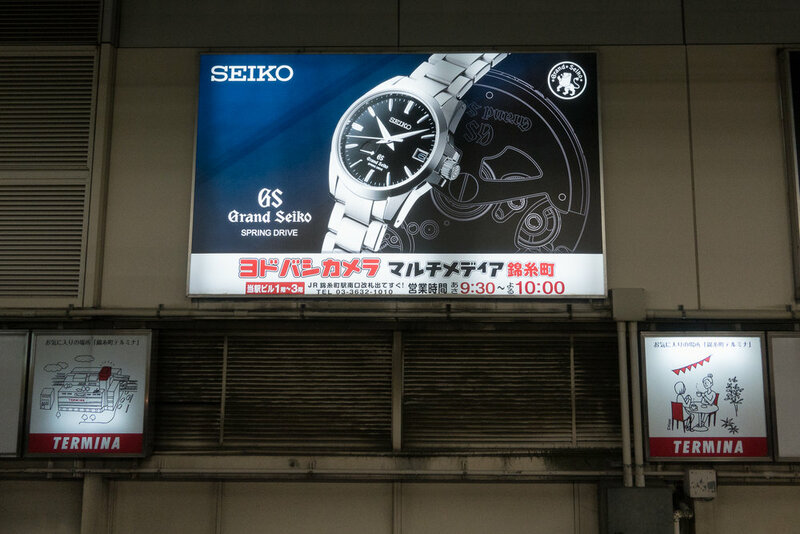 At the train station on my way back there was a large Grand Seiko Spring Drive advertisement. 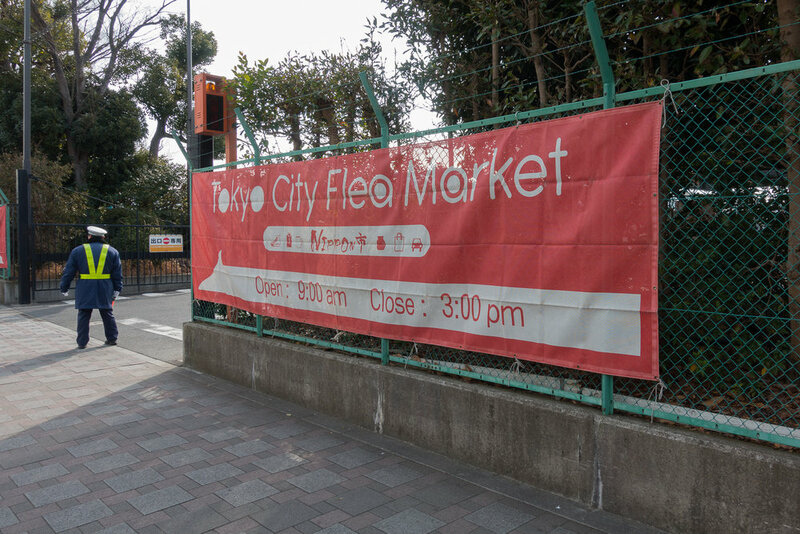 On the Saturday morning I headed back to the Tokyo flea market and checked out the stalls. Unfortunately there was no bargains to be found but it was an enjoyable start to the day. I then headed to Shibuya and visited Kusumoto. 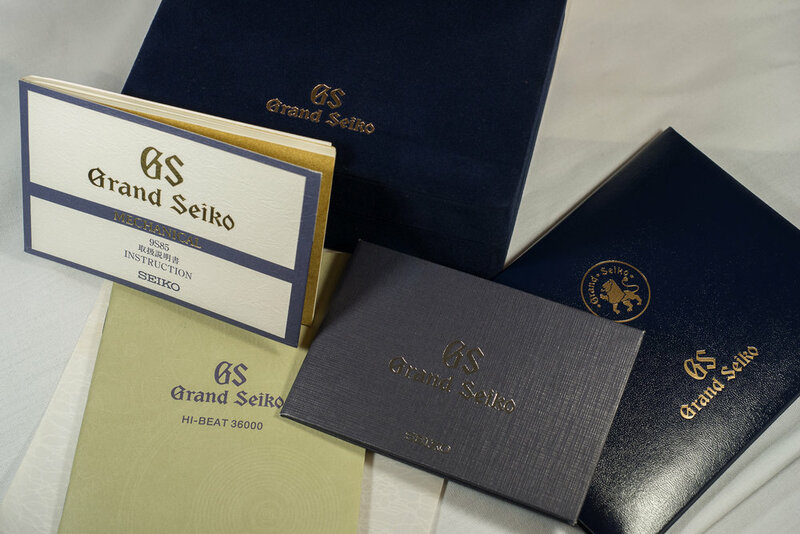 They often have some interesting vintage pieces but this time they had just a few modern Grand Seikos and a mix of various Swiss brands. After Kusomoto I stayed in Shibuya and headed across to House Kihiroba and then the Daikokuya store. Just next door to Daikokuya is the Shibuya Ippuukishi store located on the second floor. 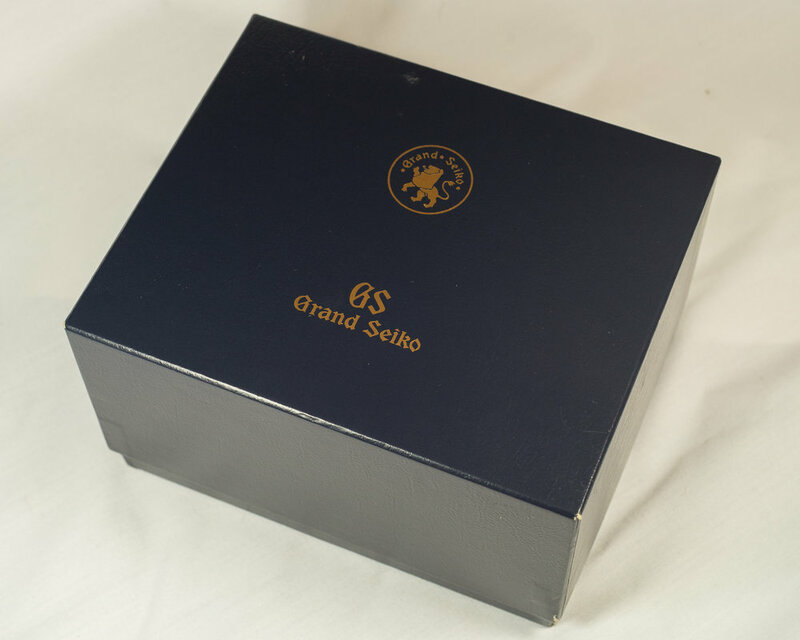 They have a wide selection of watches and one that caught my eye was a nice condition SBGH001 Hi-Beat Grand Seiko. I then headed to the BOOKOFF that is located nearby. They had a small number of watches here but nothing of interest. Upstairs I checked out their used book section and found a couple of volumes of the World Wrist Watch Time Spec magazine with Seiko focused articles and also included adverts from Seiko and Citizen. After looking around at numerous stores I decided that the SBGH001 was too good a deal to pass up so I headed back to Ippuukishi and purchased this. It came with the original boxes, manuals and paperwork. 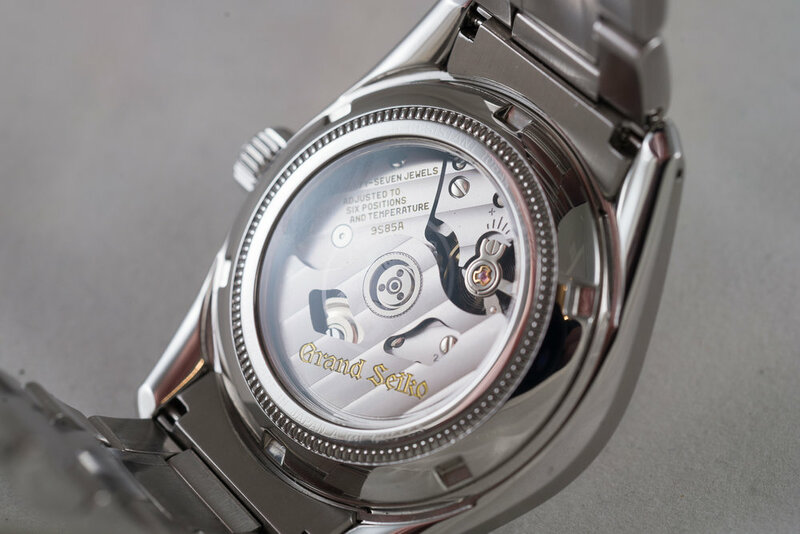 This is a nice clean design that captures all of the design elements of Grand Seiko. It is a pleasure to see the sweep of the 9S85A Hi-Beat movement in action. 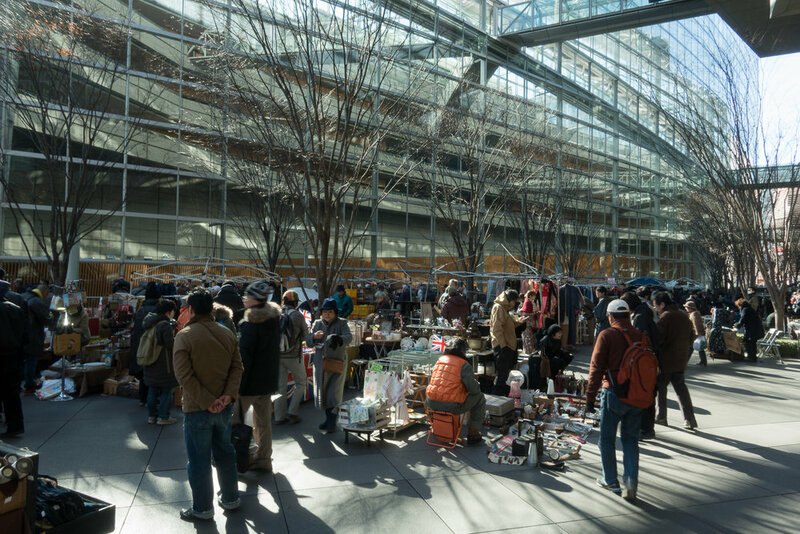 On the Sunday I went to the market at the Tokyo International Forum. This is located in the courtyard that is next to the main building beside the Yūrakuchō station near Ginza. This market is mainly attended by professional antique dealers and there are numerous booths with watches available. This time I did not find anything to take home but there were numerous interesting items. 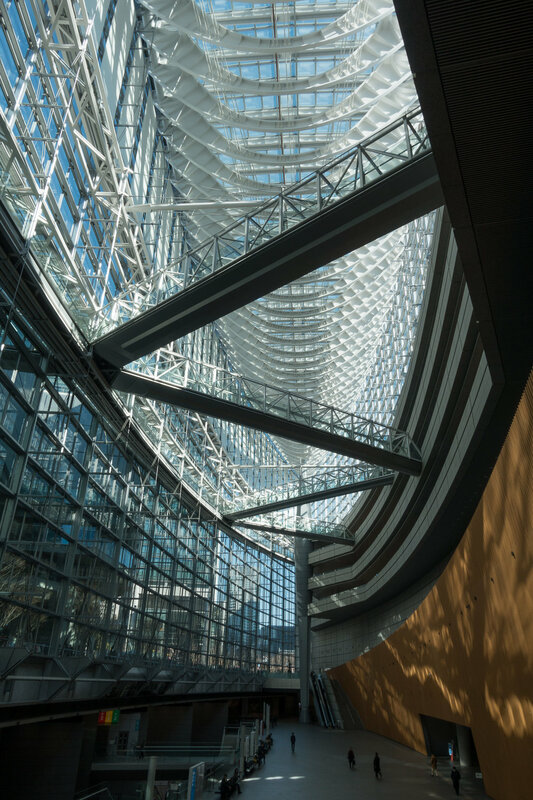 If you have not seen it before it is worth walking into the Tokyo International Forum building as it is an impressive piece of architecture. After the market here I visited some general stores in Ginza and headed to the Antique Mall Ginza. Here they have a number of stores on the lower floor that have watches and you never know what can turn up. When I left the mall I walked about a block and saw the headquarters of Seiko Watch. This is just an office complex and there is nothing for the public to see here but as it was just a minutes walk away I thought I would go by. I headed back to the station and went to Ueno to visit Mizutani-sans store. As always there was a huge selection of models available and lots to see. While there were many nice models there was nothing that grabbed my attention. On the Monday morning I headed to Tokyo station to catch a shinkansen north to Morioka. I caught the Hayabusa train and this took a little over two hours to arrive in Morioka. When I arrived at the station it was snowing heavily so I headed to my hotel to drop off my bags. I then walked around town and dropped by a local watch store Michimata. 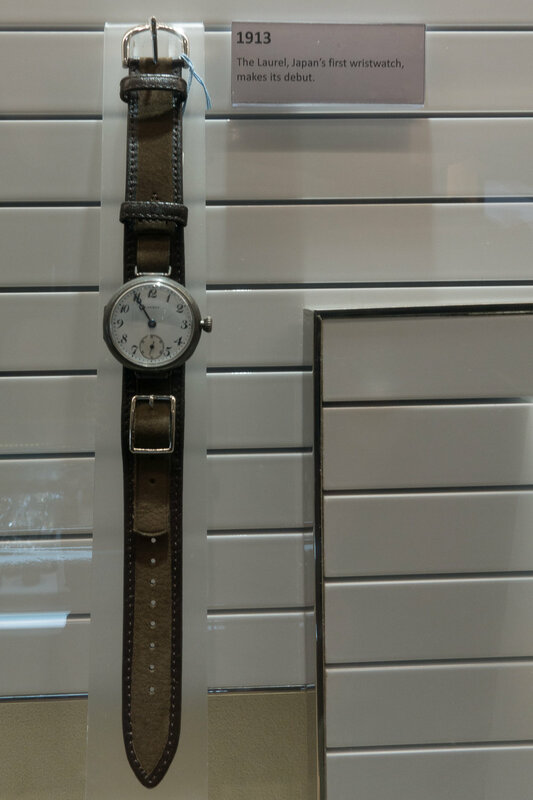 They had a good selection of domestic watches including some previously released limited editions. 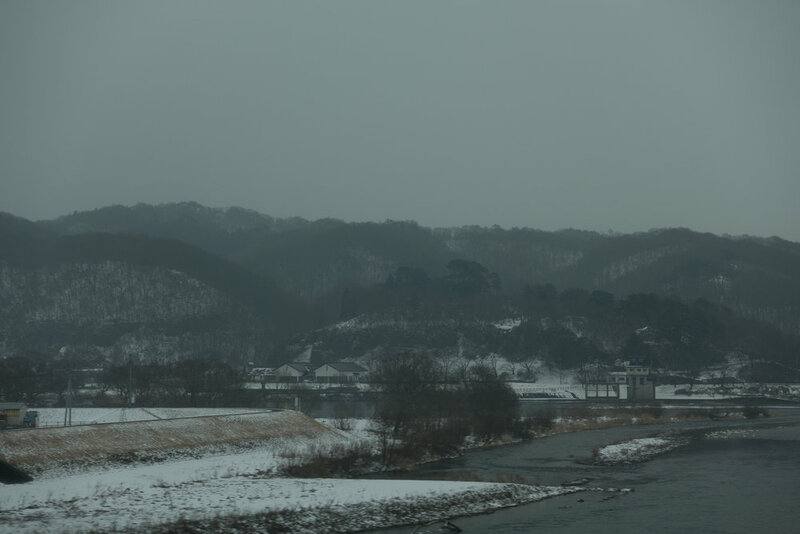 After grabbing some lunch I caught a cab to the Seiko factory as it continued to snow heavily. This was my second visit to the factory but I managed to see some different areas of the facility. A full write up of my factory visit can be found HERE. 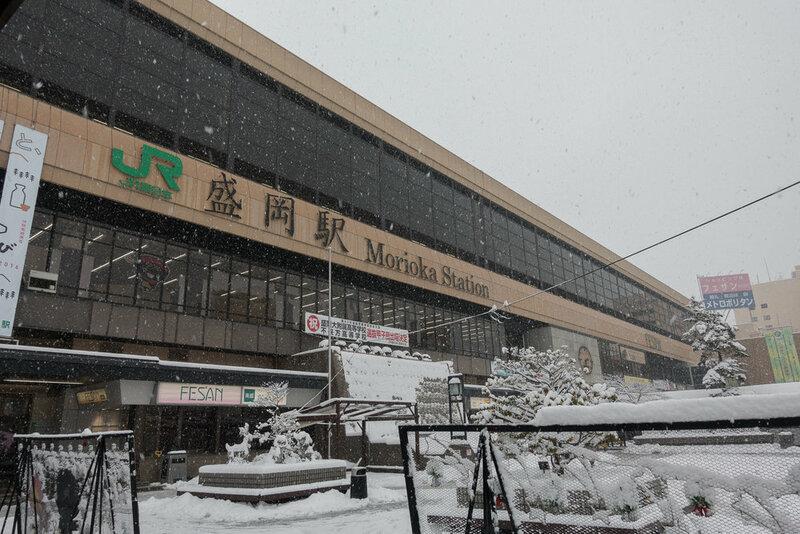 After the factory visit I headed back to Morioka where I stayed the night. On the Tuesday morning I caught the Komachi shinkansen back to Tokyo and then another shinkansen south to Nagoya. 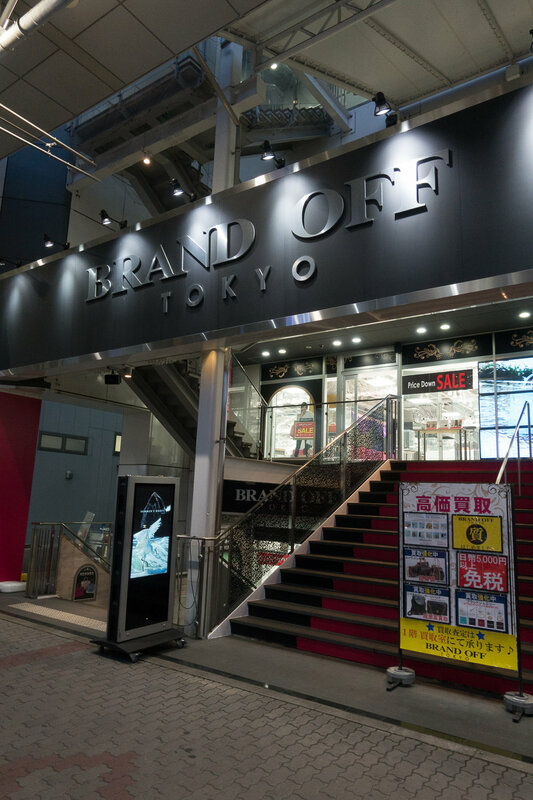 In Nagoya I checked out a number of brand stores including Brand Off Tokyo and then the close by Komehyo. This is an interesting store as the have a wide selection of new models for sale as well as a good mix of second hand models. Nothing here caught my eye so I headed across to the nearby small independent watch store. Unfortunately this store was closed and there was construction taking place next door. I next headed across to Big Moon and enjoyed their store but did not find anything I needed to have. As it was getting late I headed back for dinner. 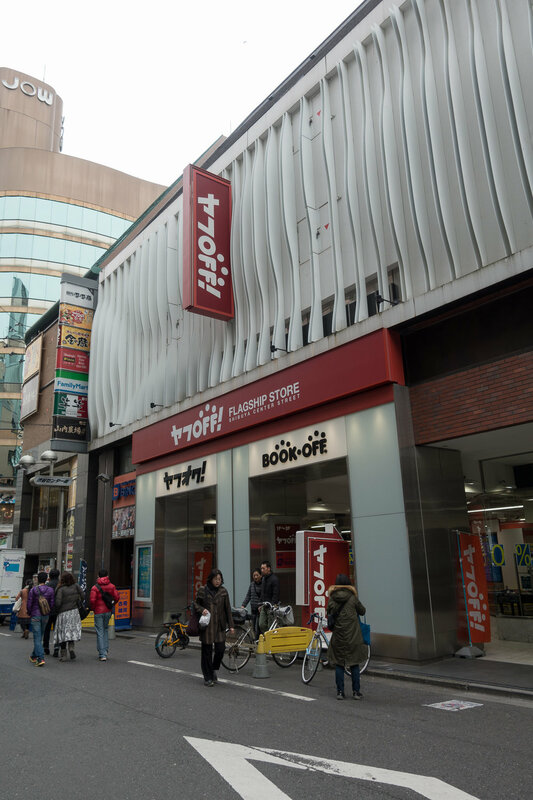 On the Wednesday morning I went to the large Nagoya BOOKOFF Super Bazaar store where I have found some interesting items on my previous trips. This time I was also able to grab a few interesting items. 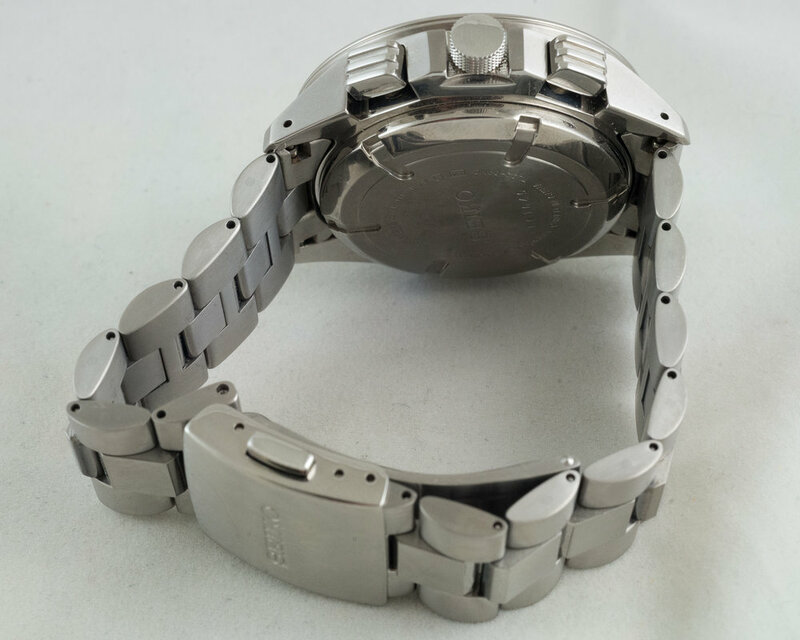 First was a SBHV009 (7L22-0AN0) Kinetic with an interesting shaped full Ti case and bracelet. The colour mix on the dial is also unusual with a brown bronze background and white, yellow and small blue accents. The chronograph functions on the 7L movements have a very nice mechanical feel when operating the start, stop and reset. The next watch was a 5854-5000 quartz model from 1978 with an integrated bracelet. These bracelets have to be cut to fit the wearers wrist size and are usually too short for me. It is also very common to see the bracelets that have been bent and damaged or even affected by corrosion so I was very happy to find this example that fit me and was in excellent condition. The watch also has an onyx crown and clean simple design but the bracelet is really the key feature. The final watch was a Tomony jump hour model from 1977. 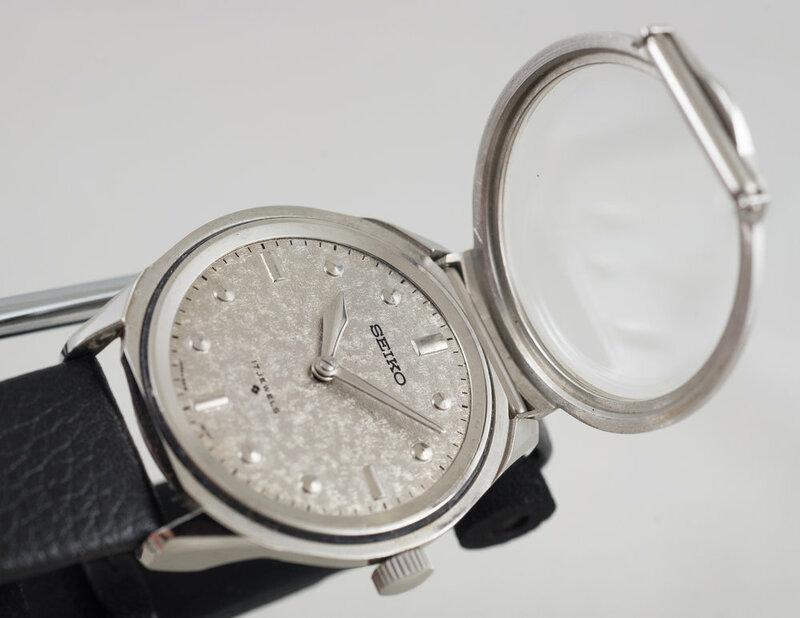 These models were only made for that year and were the only vintage jump hour that Seiko made. This example is the KG024A (5018-5010) and it originally retailed for ¥6,800. There were a few colour variations of this asymmetrical case design as well as a symmetrical shape and a couple of transparent cased versions. The small central circle is actually the second hand and there is a small indicator on this. If you are not aware Tomony was a Seiko sub-brand from the 70’s that released low cost adult watches. During the same period they also had the School Time brand that targeted the youth market and leciel that was a low cost womens fashion brand. After these catches I headed back to the station and caught the shinkansen to Osaka. When I arrived in Osaka it had began to rain so I just had time to drop by the Komehyo store in Umeda before heading to my hotel and grabbing some dinner. On Thursday I headed to Kobe to check out some stores there and see what I would find in a different neighborhood. While wandering around in Kobe I attempted to look up an online watch seller (Antiwatchman) that often has some interesting items for sale. It turns out that despite having an address and opening hours listed on their site they do not actually have a physical store location and the address was just a residential address. After doing some more investigation it seems that they are only a consignment store and the items actually stay with the owner until they are sold, they then ship to the store who checks the items and then forwards these onto the buyer. Unfortunately this site does not ship to international addresses and at the time they had a very reasonably priced 7549 tuna so I was a little disappointed that they did not have a physical showroom. After this unsuccessful trip I headed a little further south to Akashi to visit the planetarium there. The train I caught had a driver with a less commonly seen JR issued Citizen pocket watch. The Akashi Planetarium was built at 135 degrees east longitude and is the position that was selected as the official location for the Japanese Standard Time (JST) meridian on 1st January 1888. This meridian was selected as it is located so that the sun is positioned exactly overhead at midday. 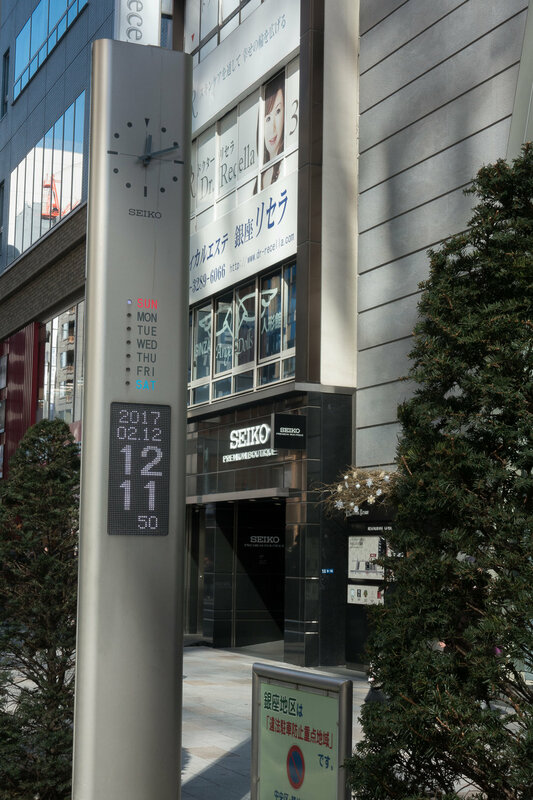 The building is dominated by a 54m tall tower that is topped with a 6.2m Seiko clock. 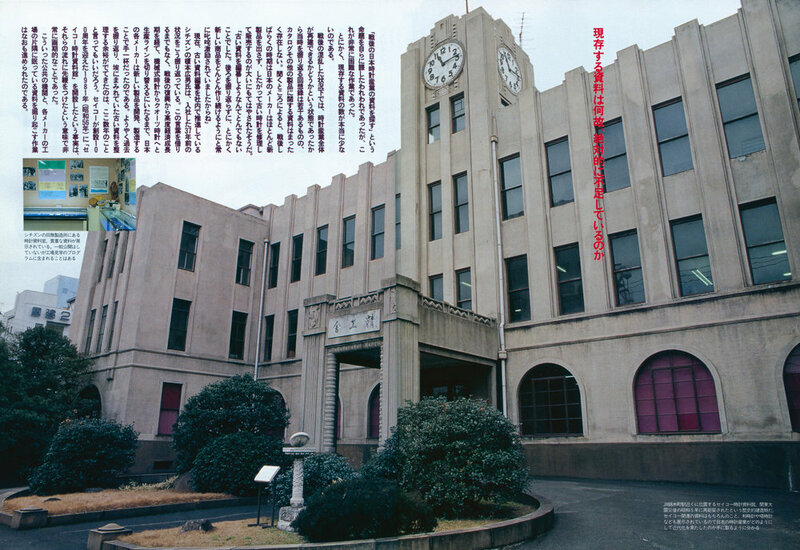 This clock and tower are pictured on the front cover of the August Seiko News from 1961. The planetarium was temporarily closed for renovations so I headed back to Osaka. 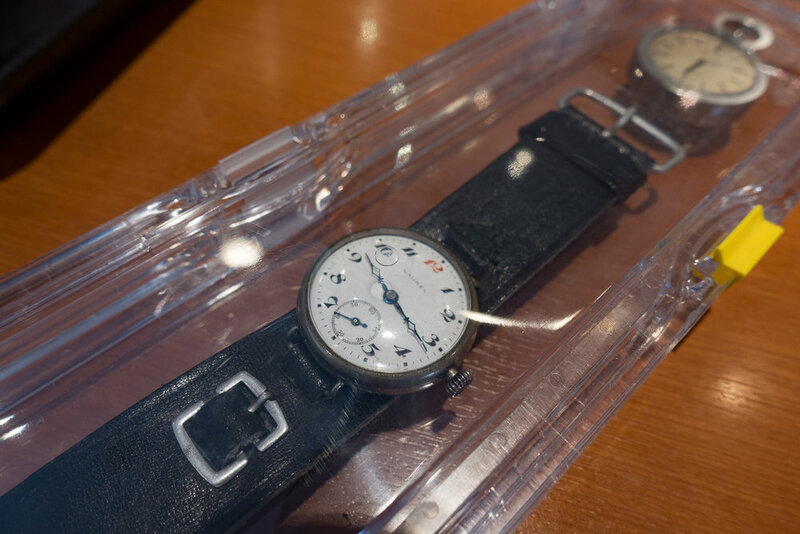 When back in Osaka I headed over to the vintage watch store Anytimewear to see what they had in stock. Unfortunately the store was closed so my unsuccessful day continued. The Anytime website does advise that you should call ahead and make a booking but I have spoken to other customers who have been able to just drop by. I headed to a vintage watch store in the Samba Centre in Hommachi on Friday morning to see what they had available. 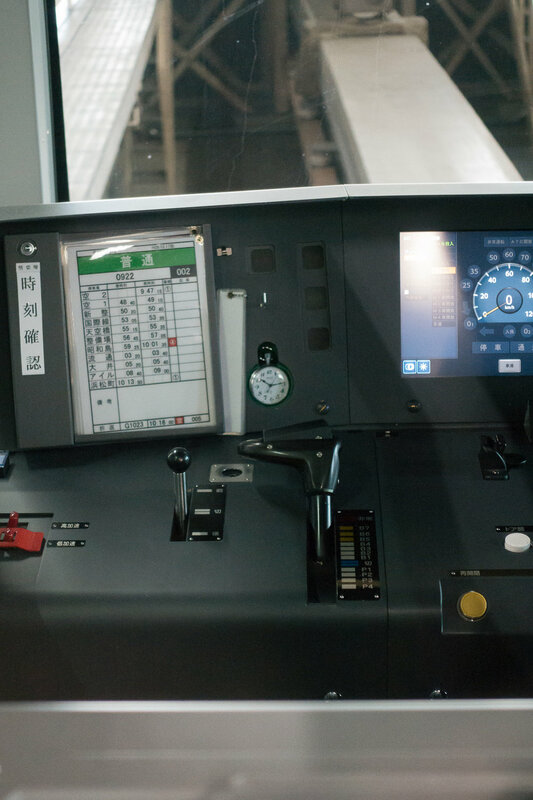 On my way there I caught the Osaka loop line and the train driver was using a Seiko 7C21 pocket watch. 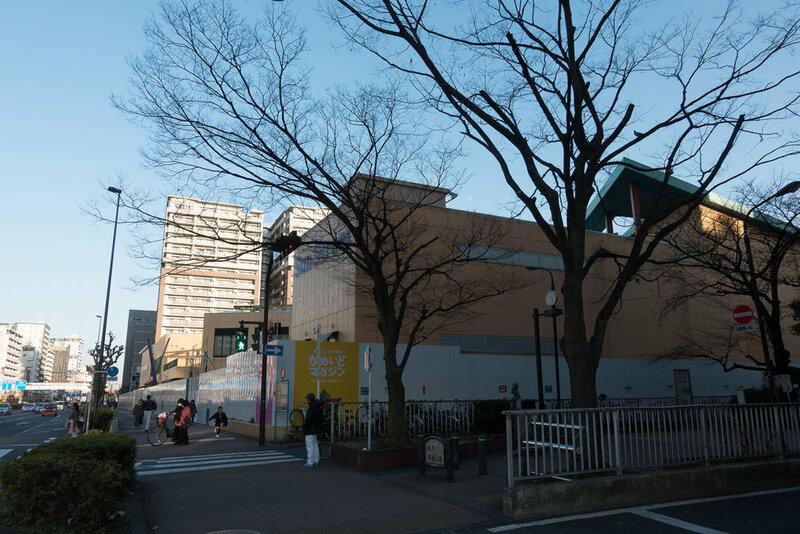 The Samba Centre store is located in the mall that runs underneath the highway and is at the mall entrance located closest to the Hommachi station or just next to the Hard Rock Cafe if you are already at street level. There were quite a few interesting vintage pieces but nothing that I had to have so I left empty handed. I next headed across to the Shinsaibashi Shopping Arcade at Minami. This is a 600m long shopping mall and it contains a wide mix of stores including various second hand brand stores. I visited the Kohmeyeo, Daikokuya and Ippuukishi stores and while there were lots of watches available I did not find anything for me. Just a little down the mall there is a BOOKOFF Plus+ store. Here I spotted a very reasonably priced SBCM029 (8F35-00A0) diver. 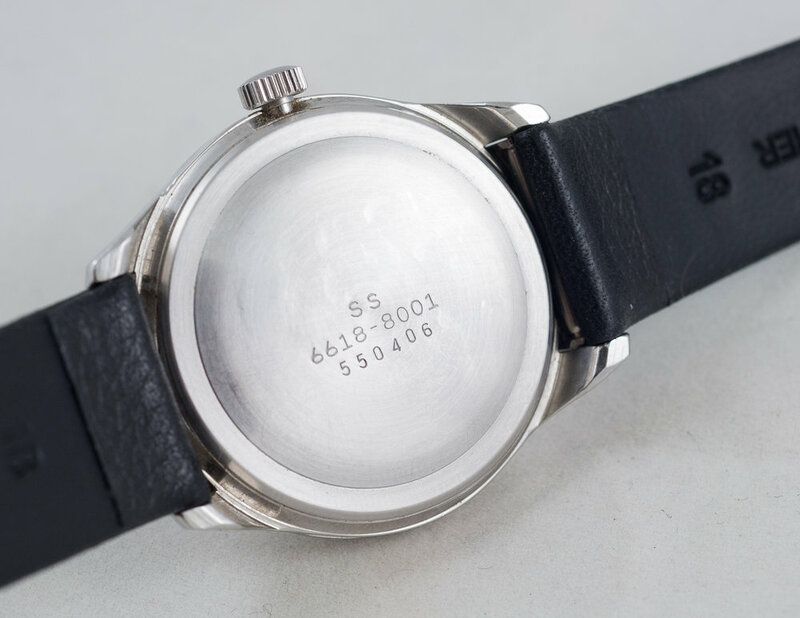 This has the 8F35 HAQ movement that is rated at -/+20 sec per year and features a perpetual calendar so you never have to worry about setting the date. There is a slight scratch on the glass and the golden bezel insert is very faded but I had been looking for one of these for a while so I was happy to pick it up. It also came with the original inner and outer boxes and paperwork. Before leaving the store I also checked out the watch magazine section and picked up a couple of World Wrist Watch Time Spec issues featuring a number of Seiko and Credor adverts and articles. On my way back to the hotel I stopped off at Yodobashi and picked up a selection of watch batteries and a strap for the 6618 blind watch that I purchased earlier in the trip. 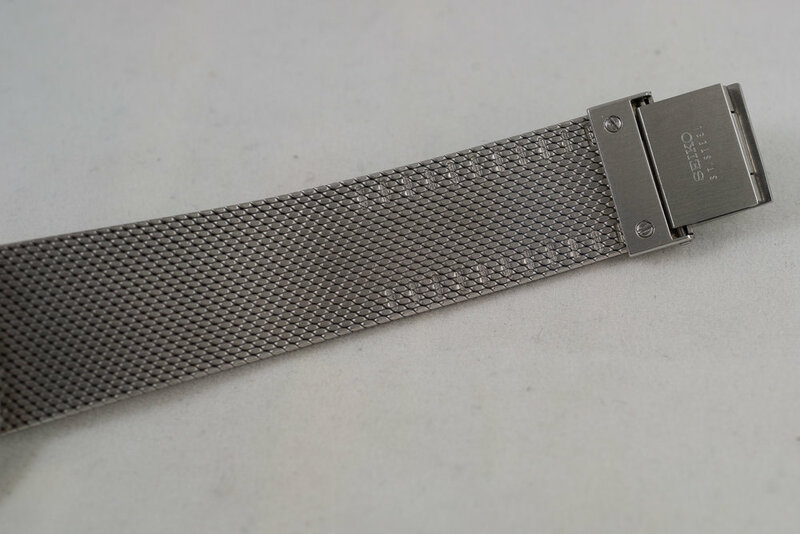 This strap was very similar to the original strap these were originally sold with. I picked up my luggage at the hotel and then headed back to Tokyo. After checking into my hotel I headed to Yodobashi and picked up a couple of B2 frames, I have a few Seiko store posters and this sized frame is difficult to purchase off the shelf in Australia for a reasonable price. The store had just a couple of the same style in stock so I purchased both of these. On the Saturday morning I visited the FMWV watch market in Ikebukuro. This was interesting as always and there were many high quality pieces on display. One of the sellers at the market was Yoshihiko Honda who is one of the co-authors of the new releases of the Japanese Domestic Watch series of reference books. Honda-san advised me that the next book in the series will cover Ricoh & Takano. This volume is expected to be completed and published in around 12 months time. At the market I purchased a Citizen 8100 chronograph, this is in nice condition and is running well. It has a period Citizen bracelet on the watch but I am unsure if this is original to the watch. I also purchased the first Citizen ParaWater model. 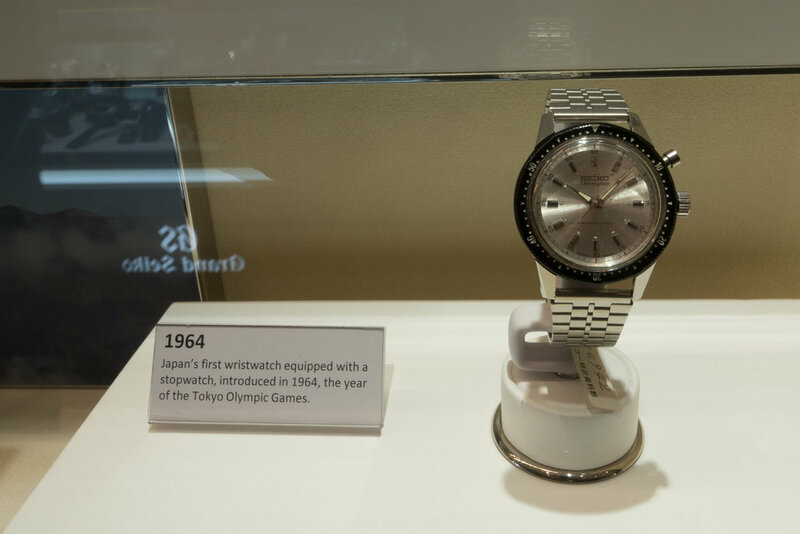 The watch was Japan’s first water-resistant watch and it was released in 1959. 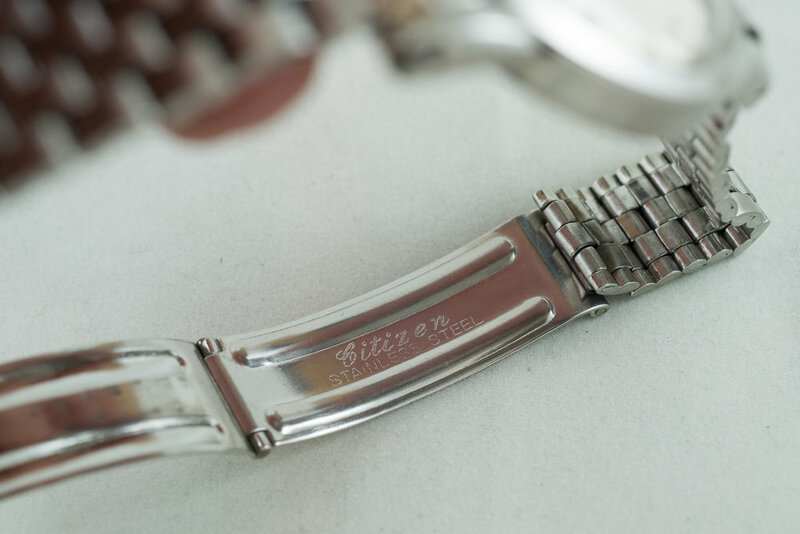 This example was released in 1960 and came with the original bracelet and hang tags. It is not surprising that most of these original bracelets did not survive as the links on this seem to catch easily and the bracelet could be easily be twisted or damaged. There is a small scratch on the plexi crystal but the rest of it is in great condition. I also purchased a “dead stock” Seiko 7018-7000 one-eyed Panda in great condition and still has the original bracelet resizing instructions sticker on the clasp. The 7018 came from the Daini side of Seiko and was the competitor to the Suwa 6139 but adds flyback functionality. While at the market I met Justin a fellow Sydney based watch enthusiast who was traveling in Japan at the same time. 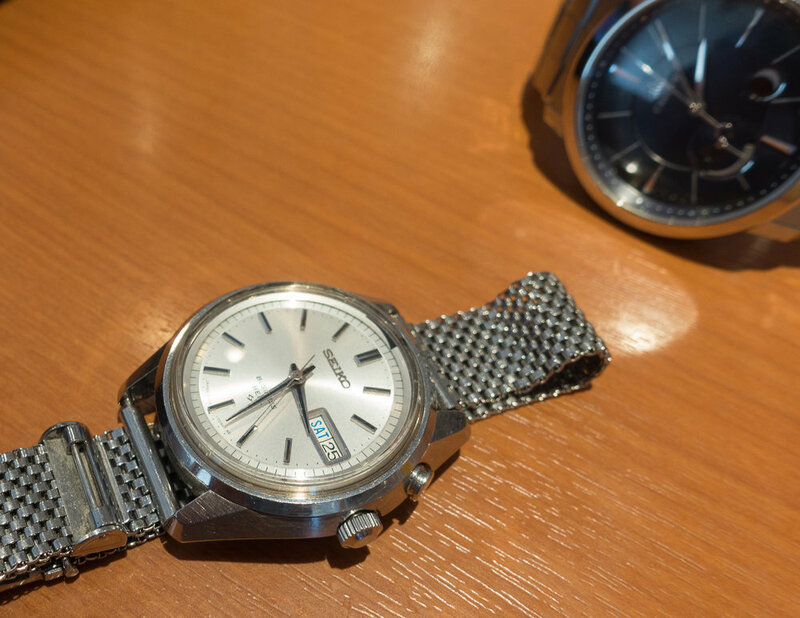 After checking out the vintage watch market we headed across to the Seiko Museum. The museum was not too busy on the Saturday and while my usual contact there had the day off we checked out all the exhibits. After the museum we grabbed a quick bite to eat across the road and Jason showed me his original Laurel model and also a very interesting small pocket watch. He also had his daily wearer a Business Bell and his fantastic GCLL999 Credor Node. It is great to see watches from other people's collections and these were in very nice condition. After lunch I left Jason and dropped by Yodobashi in Akiba to pick up another couple of B2 frames to match the others I had purchased the day before. After dropping the frames back to my hotel I headed across to a cafe to catch up with Björn and Martin. 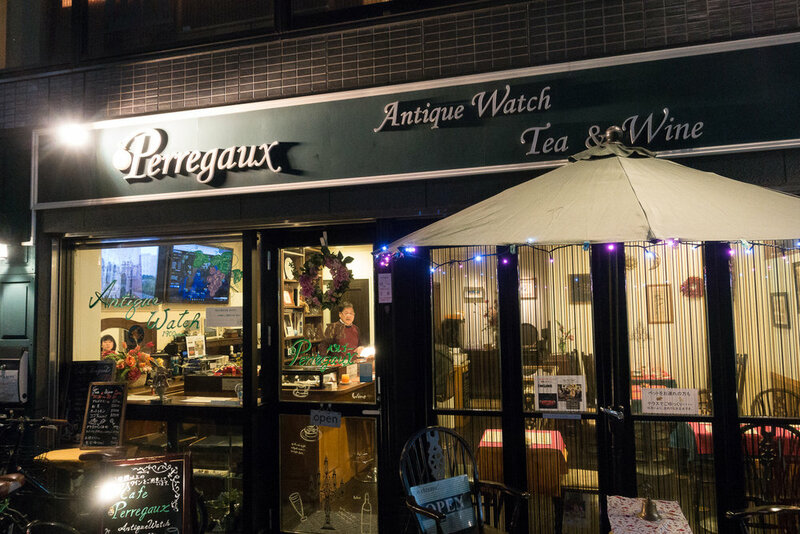 We met at the Perregaux Cafe located just near Kagurazaka Station. Here they not only sell tea, wine and beer but also have a range of vintage watches on display and for sale. Most of these were Swiss models but it made for an interesting meeting location. After a quick drink here we all headed back to Björn's place for a fantastic dinner with his wife. Over dinner Björn and Martin shared a couple of new additions to their collections. While they both have some of the most impressive collections of Seikos I have ever seen these new additions were something that I did not think I would ever see outside of a museum. 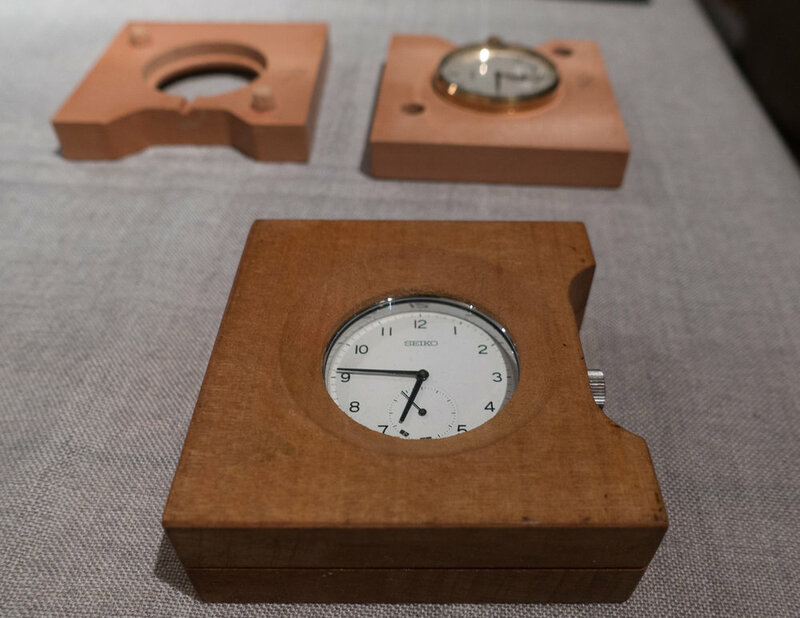 These were two original pieces that had competed at the Neuchâtel Observatory trials in Switzerland. Martin's example was a golden finished 18,000 bph model and Björn's was the silver Hi-Beat 36,000 bph unit. These came in their original transport casings that were used for the trials. They have the very long stem and crown assembly to allow them to be wound and set while in the casings. To minimize the volume of the movements the units have a distinctive potato shaped caliber. 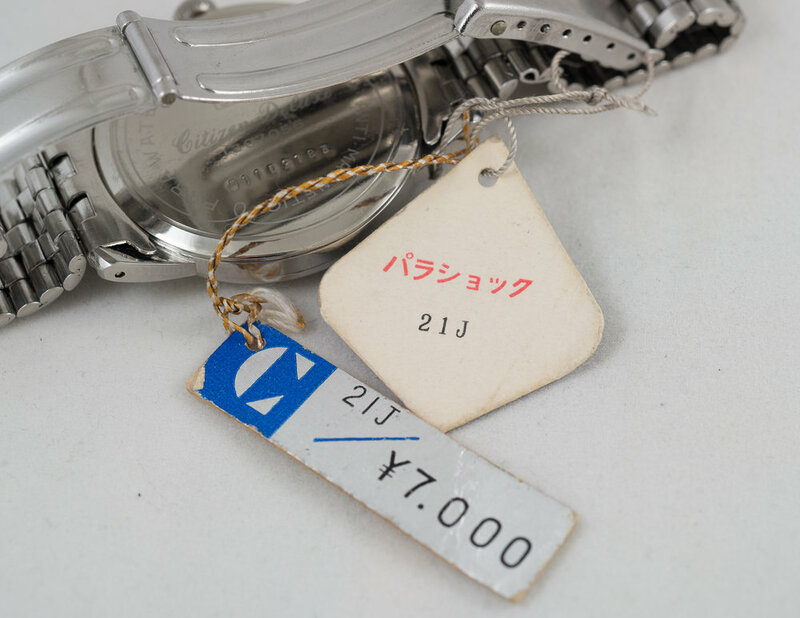 Neither of the movements had obvious caliber numbers on them but each had a six digit serial number next to the Seiko marking. Interestingly the dial of the Hi-Beat model was marked JAPAN 9896-5010R at the base while the low beat golden example was simply marked JAPAN but more details may have been obscured by the case. These make great companions to the Official Observatory Chronometer that Björn also has in his collection. While these are not pieces that can be worn they would be items that any serious Seiko collector would love to add to their collections and I felt honored to be able to see and play with them in person. On Sunday morning I dropped by the Tokyo Flea market and met up with Björn and Martin. Unfortunately none of us found any bargains but it was a pleasant morning. 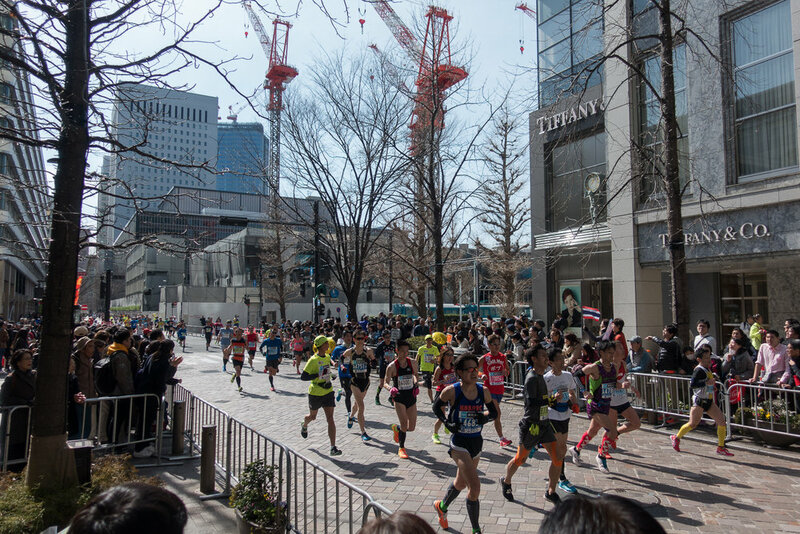 After the markets I caught the monorail and then transferred to the train to head to Tokyo station where the 2017 Tokyo Marathon was taking place. Seiko was the official timekeeper as they have been for numerous years. 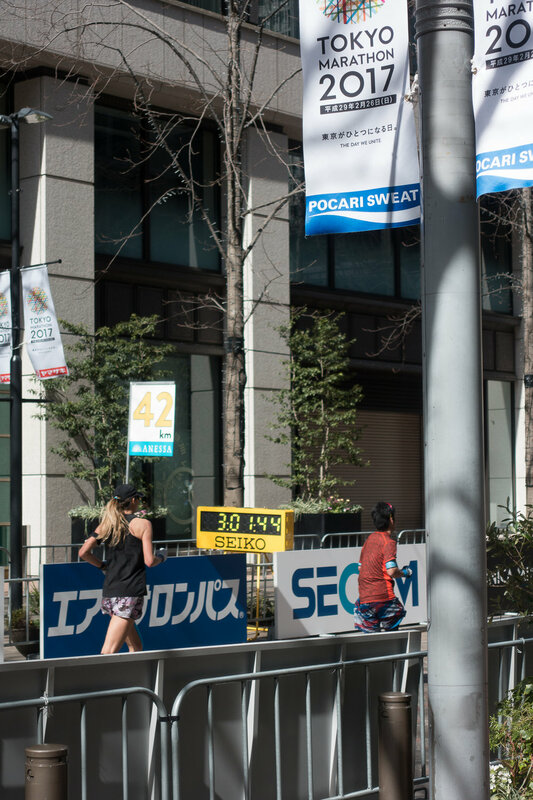 It was difficult to get around the area as many of the streets were blocked and it was not possible to get to the finish area but I did see a Seiko timer close to the finish area. After checking out the race area I headed back to Shinjuku and quickly visited Best Watch, Ippuukishi and Daikokuya. There were no bargains to be found so I stopped at the Yodobashi store and picked up a collection of current brochures from Seiko and Citizen. These are quite heavy so it made sense to grab these just before leaving so I did not have to carry them throughout the trip. I then headed off to the airport and caught my flight back home. As always I thoroughly enjoyed my time in Japan and look forward to my next visit.